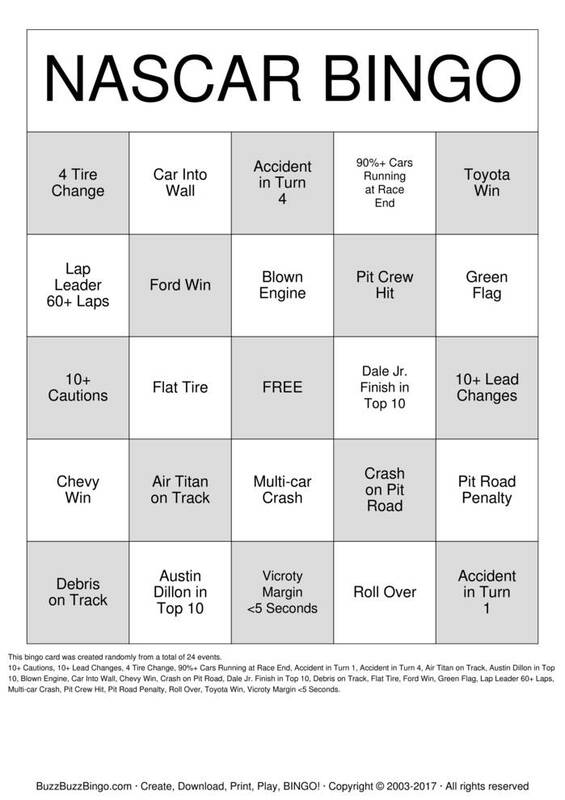 NASCAR Bingo Cards to Download, Print and Customize! Print 2 pages of NASCAR Bingo Cards for free. Download a PDF with 2 free pages of bingo cards plus instructions and a randomized call sheet. Play NASCAR bingo in a browser or customize the events, free space, etc. Purchase more randomly generated bingo card pages below. 10+ Cautions, 10+ Lead Changes, 4 Tire Change, 90%+ Cars Running at Race End, Accident in Turn 1, Accident in Turn 4, Air Titan on Track, Austin Dillon in Top 10, Blown Engine, Car Into Wall, Chevy Win, Crash on Pit Road, Dale Jr. Finish in Top 10, Debris on Track, Flat Tire, Ford Win, Green Flag, Lap Leader 60+ Laps, Multi-car Crash, Pit Crew Hit, Pit Road Penalty, Roll Over, Toyota Win, Vicroty Margin <5 Seconds.